The upcoming Honda Civic will go the CKD route, sharing its assembly line and drivetrains with the 2018 Honda CR-V.
Honda will assemble the 2019 Civic at the Greater Noida plant along with the 2018 Honda CR-V. The 2019 Honda Civic midsize sedan is one of the most awaited launches of the coming year, and there has been plenty of anticipation about the India-spec model. 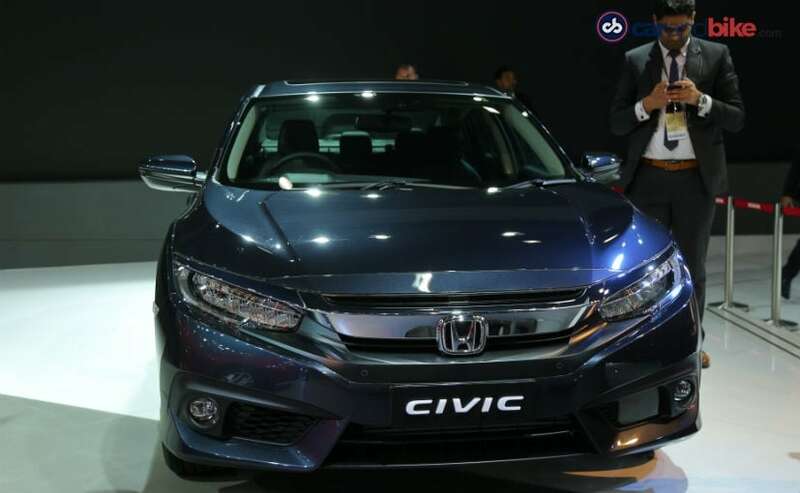 Honda Cars India has confirmed to carandbike that the 2019 Honda Civic will be launched in India as a locally made product. The plan is to assemble the Civic locally using completely knocked-down or CKD kits, at the Japanese carmaker’s Greater Noida plant near Delhi. The Civic will share the recently launched 2018 Honda CR-V’s assembly line at the plant. “We had upgraded our Greater Noida based production facility before we started the production of the 2018 Honda CR-V to accommodate new models. The assembly lines at both of our plants (Greater Noida, Uttar Pradesh and Tapukara, Rajasthan) are flexible and we can produce multiple models on them,” a Honda Spokesperson told carandbike. According to sources within the company, the 2019 Honda Civic will have a 68 per cent localisation level. That is a touch higher than the CR-V’s 65 per cent. We hope that also indicates that Honda will try and position the Civic aggressively, and so may price it competitively. Moreover the Civic will also share drivetrains with the CR-V which means both petrol and a diesel variants can be expected. The diesel is the 1.6-litre Earth Dreams motor that debuted in India with that new CR-V and is also locally produced at the Greater Noida plant. This engine produces 118 bhp at 4000 rpm and 300 Nm of peak torque at 2000 rpm and is mated to a nine-speed automatic transmission. Similarly, the petrol variant will most likely be powered by a 2.0 Litre petrol i-VTEC engine that develops 152 bhp at 6500 rpm and 189 Nm of peak torque at 4300 rpm. This engine is mated to a CVT gearbox as standard. It is unclear whether Honda will bring the Civic with a manual option too. Honda Cars India has an annual production capacity of 280,000 units. At present, Honda is utilising 180,000 units of its capacity which is likely to go up by another 50,000 units once the production of the upcoming Honda Civic starts. The added volume should take the production capacity utilisation to around 230,000 annually. We had recently reported that Honda has started the use of 3D printing in India and the current-generation Honda Amaze is the first model on which it’s been used. However, the company has not confirmed any such news about the upcoming Honda Civic. Honda Cars has said that the launch of the 2019 Civic is scheduled in the fourth quarter of the current fiscal, and so we expect the car to launch in February. The eighth-generation Honda Civic was launched in India in 2006 and was a radical looker for its time. The car then caught the attention of many and ruled its segment. Now the tenth generation model will too have its share of competition. The primary rivals will still be the Toyota Corolla Altis and Skoda Octavia. If the localisation and powertrain sharing helps Honda to price it competitively, it will be interesting to see if the Civic brand can rewrite its previous success for Honda and become a new benchmark in the midsize sedan segment.